JUST WHAT WAS Madeleine Albright thinking last Friday when she placed a conference call to the Conference of Presidents of Major American Jewish Organizations? Does she really think the leaders of the so-called "major" Jewish organizations are so full of themselves that they really believe they have the right to join in her bullying of the democratically elected government of the State of Israel? I think the answer is obvious. Yes, she really does think these unelected American Jewish "leaders" believe they better represent the interests of the Jewish people than the man who was directly elected by the people of Israel to guard their interests and negotiate for them. What's worse, some of these characters are actually under the impression that they have the right to intervene in disputes between Washington and Jerusalem and will allow themselves to be used to batter Israel into giving in. Indeed, Some of the leaders of the Conference are the sort who think their briefings from the State Department and other "insider" dope gives them a better handle on events than the Israelis. According to a transcript of the call obtained by the Jewish Telegraphic Agency, Albright said, "We need help in having the Israeli government understand that we are doing our very best to protect their security, and that this, in our best judgement is the best way to go about it." Of course, the current Israeli leader is easy to second-guess. 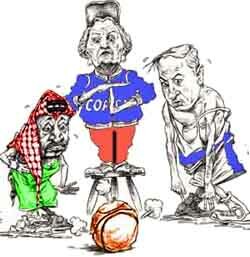 But the fact remains that the Oslo process is not being stalled by Benjamin Netanyahu despite the spin coming from the State Department and Arafat's apologists. According to both public statements and leaks coming from both Jerusalem and Washington, Bibi continues to give and to give, raising the percentages of territory he's ready to surrender all the time. The process is at a standstill because the Palestinians aren't interested in abiding by the agreements the Israelis have signed with them. Israel has abided by its commitments in the Oslo process, the Palestinian Authority hasn't. But that doesn't seem to bother the State Department or some of these Jewish leaders. Some Jewish leaders tell me that the opportunity to achieve peace calls for extreme actions by American Jews. "We're so close to peace," one told me. But do these leaders really think they want peace more than the Israelis? And given the inability of the Palestinian Authority to deliver on its promises so far, what makes them think that the future will be any better? Let me reiterate that this is not about whether one likes Mr. Netanyahu or approves of his policies. What this is about is an American Jewish leadership group choosing to join in an American squeeze play on the government of Israel. These "leaders" have no such brief from the rank and file of American Jews and they know it. Let us make this crystal clear. If the Conference or its members aid Albright in her "we know best" effort to pressure Israel to give more than it thinks prudent, they will have forfeited any claim to legitimacy they may once have had. These are some of the same people who were telling critics of Oslo that American Jewish groups were obligated to support the policies of the government of Israel from 1992 to 1996. Now they are singing a different song. My sources tell me that Ms. Albright will be placing another conference call this week - not with a chastened Conference but with a group of Jewish bigshots who are eager to support the Clinton Administration's muscling of Israel. It's a free country and if these men and women wish to dissent, that is their right. But if they are claiming to represent the orgnized American Jewish community, then they have no right to join in the Bibi-bashing. Their duty is to tell the State Department that the government of Israel will decide what is in the best interests of the people of Israel. Period. That was their position when Shimon Peres and Yitzhak Rabin were in office and the principle still applies. Any other response will brand them as a politicized, divisive cabal. As for the Conference, the next time she calls with such a message, maybe the best course of action would be to just hang up. JWR contributor Jonathan S. Tobin is executive editor of the Connecticut Jewish Ledger. 3/27/98: Will American Jews help Clinton push Israel into a corner?